Conferences are one of the best investments I make in my writing. Last month I attended the Western Washington SCBWI conference in Redmond, WA. I came away energized ready to plow into revisions and test out new ideas. Being around a group of people who shared an interest in children’s literature was inspiring. Workshops ranged from writing picture books, making the first page of your novel count, and how to connect the plot points of your novel to marketing your book, getting an agent, and what agents and editors see happening in the publishing world. Each gives the aspiring author tools to help make his or her manuscript the best it can be. There is also plenty of time to network, not just with the presenters, but also with the fellow attendees who may become a critique partner or just someone else in the industry to go to for advice and/or support. Visiting with writers- published and unpublished- allows attendees to hear success stories and lessons learned by others who share the goal of publication. Inspirational speeches by both an illustrator and an author rounded out the program. Learning about their journeys was enlightening. The common thread throughout both talks was an emphasis on persistence and hard work. Good writing doesn’t just happen; it is the result of continual writing and revision. Attend a conference! You’ll be amazed at how much you can learn. Every year in February we get a few weeks of beautiful weather. 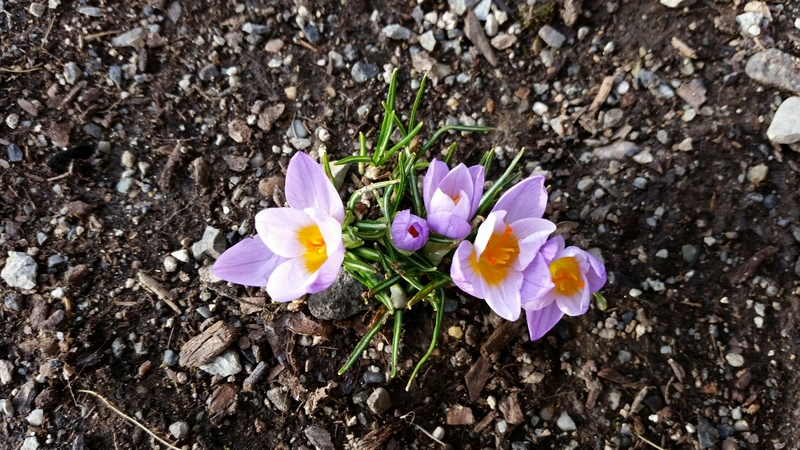 This year the crocuses are blooming, the sun is shining, and the temperatures are pleasant. The problem with all of this is that it is the end of February. So despite the fact that many of the area farmers have kicked their preparations for spring work into high gear, I’m not convinced that spring is here. I don’t think there has been a year when we haven’t had some type of variation of this pattern. A week ago we had dreary skies and fog. 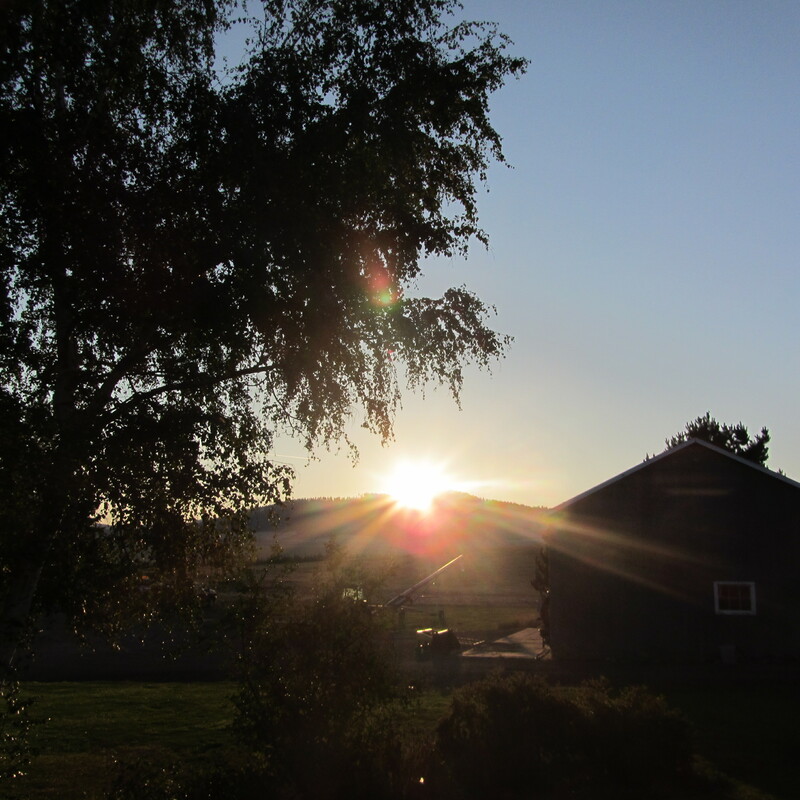 This past week it was all sunshine and great walking temperatures. Usually when we experience weather like this, one person in this house is convinced we are going to have an early spring. I am not that person. It is understandable; after all, farmers don’t like to be cooped up in the house. They like to be in the field doing ‘real work.’ The fact that we have been doing farm related book work for the past three months, somehow doesn’t count as ‘real work.’ Heck, he’s a farmer, he likes to get his hands (and clothes) dirty! And if he’s not dirty, he’s not working. Most of our machinery is ready for spring work. While this is good, it also plays into the delusion that spring work …COULD START AT ANY MINUTE!!! Never mind that the fields are saturated, and that all of the field roads are impassable. Anyone who ventures out in the field now won’t get very far before sinking to the axels in mud. You Tube is full of pictures of those who simply couldn’t wait until the fields were dry. While they are entertaining to look at, it is not fun for those involved. Having a tractor or sprayer in the mud tends to turn otherwise agreeable farmers into grumpy farmers. The general rule of thumb that I was taught when I moved to the farm was that any spring work that is completed before Easter will have to be done over. This year Easter is on April 5th. April 5th is also our 40th wedding anniversary. The year we got married, one of Bruce’s uncles and several of the neighboring farmers assured me that there was no way they would be at the wedding. Spring work would be in full swing and they just couldn’t travel across the state during a work season. Well, on April 5th, 1975 they were all sitting in a church 300 miles from the farms and didn’t actually get into the fields until the last week of April that year. So much for early springs! Now, I’d be the first to admit that I could be wrong. Every now and then Mother Nature throws us a curve ball. I think she just likes to remind everyone that she’s actually in charge…those on the east coast who are digging their way out of five feet of snow can probably attest to this fact. So, who knows, maybe we will be done with spring work before May. It’s done! I’ve revised, shared with my writing group, revised again, and again (and again….) until I finally reached the conclusion that I’ve got a polished picture book manuscript ready to submit to an agent or editor. Yea, me! That’s when I remembered to make a book dummy of my precious manuscript. And I realize I should have done it long before I got to this point! A book dummy simply takes the text you have been lovingly crafting and puts it in the form of a real live book. This exercise helped me to make sure the manuscript fit into the structure of a picture book. Illustrators use a dummy to test their ideas for pictures, since I’m not an illustrator mine are usually text only–unless my granddaughter is handy, then she will provide the pictures. Picture books are comprised of 32 pages, but did you know that at least two, and sometimes up to eight of those pages are not available for your story or illustrations? If you are not sure how the pages lay out in a picture book, hop over to Tara Lazar’s site (www.taralazar.com) and click on her picture book structure post. It will show you exactly how many pages you have to work with and how they line up. Making a dummy of the picture book manuscript I have been revising over and over taught me the importance of pacing, page turns, and carefully chosen words. When I imagined the illustrations that would eventually accompany my text, I found words and sentences that would simply be a repetition of the illustration. Bam— entire sentences—gone! One of the most enlightening parts of the exercise was seeing which sentences would be opposite each other on a two page spread. I ended up rearranging some of them so they would both tie into a single illustration. These changes also improved the read aloud quality of the manuscript. In some places I added words when I realized that readers may not interpret my words that same way I do. An added bonus for me—it was the perfect proof-reading activity. Recopying my words onto the pages highlighted the places where words, usually articles—a , an, or the—had been lost during multiple revisions. I have read the manuscript over and over and never picked up on the missing words, even when reading it aloud. I have no idea whether or not an editor or illustrator would put the page breaks in the same places that I did. But I know that going through the process helped me improve my manuscript’s chances of catching the eye of an agent or editor. I’ve been on a book binge. Most of the books I have read are either middle grade or young adult. Why? Because I’m working on a middle grade novel and this is part of my research. I know, I know…great excuse to curl up in front of the fire with a book! But, the one piece of advice I have heard over and over is that if you want to write, you need to read. It could also be that I am a writer because I love to read. In the past three weeks I’ve read five middle grade books, two young adult books, and an adult best seller. Several have been 2014 Newberry honor books (I read Kate DiCamillo’s award winner Flora & Ulysses: The Illuminated Adventures earlier in the year), others have been recommended by conference faculty, and some have been the result of listening to an interview of an author, or a recommendation from a friend. I learned something about the craft of writing from each book I read. At the last children’s writing conference I attended, dinnertime conversation one night centered on reading. One younger writer said he wasn’t sure which books to read. He thought it was a great idea, but wasn’t sure where to start. 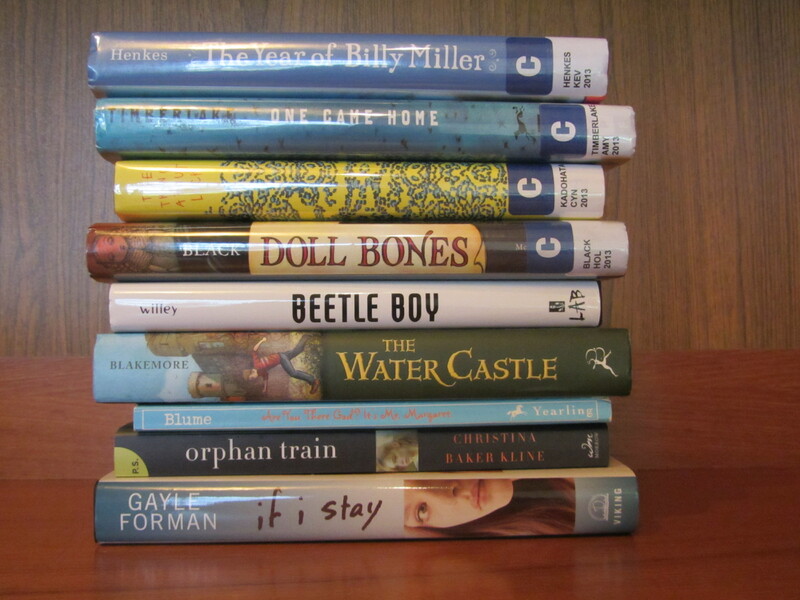 I suggested Newbery award and honor books. My goal over the past year or so has been to read all of the award and honor books from the past 10 years. My bucket list includes reading (or in some cases, rereading) all the books on the list—from 1942 to the present. I am devoting a book shelf to these award winners and using them as my reference library. Not for ideas about what to write, but as craft resources. These books teach me about character development, plotting, building tension, effective climaxes and resolutions—all things that will help me improve my book. Does all this reading take away from my writing time? Not really. I usually read in the evening, a time when my creative juices aren’t as active. It has, however, taken away from my sleeping time since I can’t seem to make myself quit reading when I’m totally engrossed in a book. So as fall turns to winter, take some time to grab some hot chocolate, wrap up in a blanket and let the world of children’s literature draw you in. Next up for me? The Year of Billy Miller by Kevin Henkes one of this year’s Newbery honor books. Have you signed up for PiBoIdMo yet? Do you like to write picture books? 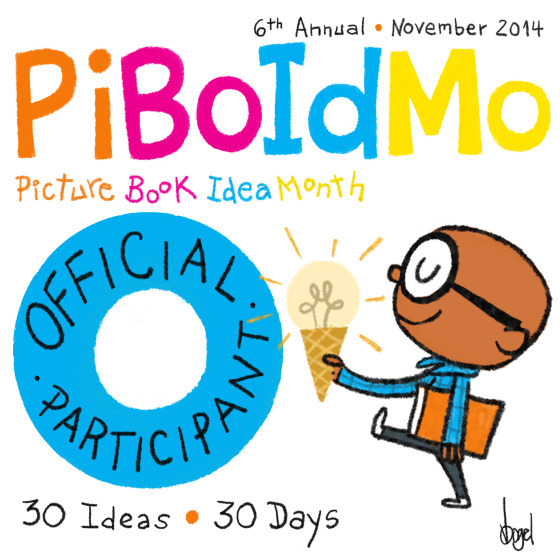 If so, head on over to Tara Lazar’s website and sign up for PiBoIdMo (Picture Book Idea Month). During November, participants come up with 30 picture book ideas, one for each day of the month. Created six years ago, the website’s daily posts from writers, agents, and editors during PiBoIdMo are full of ideas, motivation, and inspiration for those who love to write picture books. The challenge is completely on the honor system, with the real prize being a notebook full of ideas and the inspiration to transform the best into full picture book manuscripts. It’s free, but the advice found in the posts is priceless. Take the challenge…I did!